Texas Ale Project Fire Ant Funeral - AoM: Beer et al. 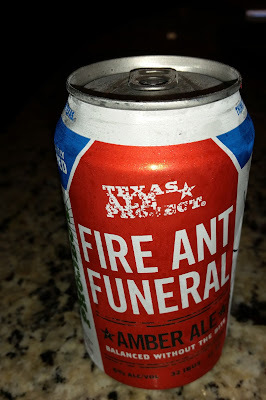 This beer was not bad. It was a little bitter. It tasted like a pale ale. AN ANTIDOTE TO THE BIG STING. A traditional amber ale complexly built from a careful selection of 7 different malts. American grown hops harmoniously round out the wonderfully rich malts. Balanced without the bite.